How much alum per gallon of water? I'd like to use alum to settle sediment in Rio Grande water. I know the amount depends on many factors, but I'd like a ballpark figure to start out with. I've seen numbers from 1 teaspoon per 5 gallons (National Park Service) to 1 tablespoon per 1 gallon (Cliff Jacobson). That's quite a range. How much did you use? I know alum can be used as a flocculant to settle silt. It does not disinfect the water. I looked into it for use on the Yukon River. But I found a product that comes in pre-meassured packets that both settles the silt and disinfects at the same time. It has worked very well for us during previous Yukon 1000 mile races, as the river silt is extremely heavy. I will use it again for an upcoming race. happened. Start with 2 per 5 gal bucket. The less you use the less irritating it is to your GI system. Diarrhea isnt your friend on the river. Getting the amount right is kind of trial and error. Gravity flow into MSR 10 liter bags was amazingly fresh clean tasty. No alum. Filter required a backflush. Lots of good info there! Thanks for posting that link there kayakmedic. I can't believe any kind of filter would work on Yukon River silt. After you get below the Teslin, and especially where the White River (aptly named) enters the Yukon, It is impossible to see even a millimeter into the water. In fact, you can hear the silt on the bottom of the canoe while paddling. It sounds just like someone is rubbing sandpaper on the boat, or the hiss of a mis-tuned AM radio. We pre-filter using muslin cloth, then add the chemical flocculant to make the water drinkable after several inches of sludge settles to the bottom of a bucket. How fish survive in that water I'll never know. Alum combines with the silt and settles out on the bottom in the layer of muck and goo you get when the process works right. So, just because you put alum in the water doesn't mean it is getting into your GI system. Most of it should end up getting thrown away with the layer of nasty stuff. I don't suppose it works perfectly, i.e., it seems hard to imagine that there is no alum left over in the cleared water. So, that is a reason to experiment and find the minimum amount of alum that works where you are paddling. Alum is used to clarify water by neutralizing the electrical double layer surrounding very fine suspended particles, allowing them to flocculate (stick together). After flocculation, the particles will be large enough to settle and can be removed. in the spice section of the supermarket but its a small amount. Its used for pickling. I asked the same question and noticed that only ONE person here actually TRIED to answer the question. The rest of you just told us to use a water filter or complained about the problems of disease. That was NOT the question. We still plan to use a water filter AFTER we clarify the dirty water! We just want to know how much alum/gal. The idea is to prepare several sealed packets of pre-measured alum powder that we can mix (on site) with 500 ml water in a Nalgene bottle. THEN, add this 500 ml Nalgene mixture to a gallon of dirty water, stir, wait and filter the clarified water. So, assume slightly murky water, how much alum should be added to 500 ml of clean water which will be dumped into a gallon of murky water to clarify that water so we can filter it and NOT clog our filter!!!! Then we can add two packets to really murky water. I've searched all over for my instructions, but can't find them. If I recall, it was something like 1/8 tsp to a 2 gallon bucket of water. It doesn't take much, and the swirling while adding it thing definitely helps to distribute the alum. I can't find Stupid Guide Tricks anymore.....darn, it was a great resource. Unfortunatly, neither of these gives the exact info we need. BUT, if the 'low' concentration is 1:100 (it is easier to guess low and add more than to add too much and have to dilute), then you would need 37.8 cc of HOUSEHOLD alum from the spice section of the grocery to each gallon of water. This bag is an old Platypus that I refused to throw away just because the top 'zipper' is broken so I use it as a scoop to hold the dirty water. I fill it to the 4-liter level from the river, choosing the cleanest water I can find, even if I have to wade into the river a bit. Then I add 40 cc of alum to a half-liter Nalgene bottle, shake to dissolve, then add that 1/2 liter to the platypus and stir. Ideally, I should add 50cc of Alum to this bag but I would rather err on the low side. If the water is really dirty, I can add another 10cc. I use my vac-seal to make a large number of small packages of 40cc Alum which I store in the platypus bag. 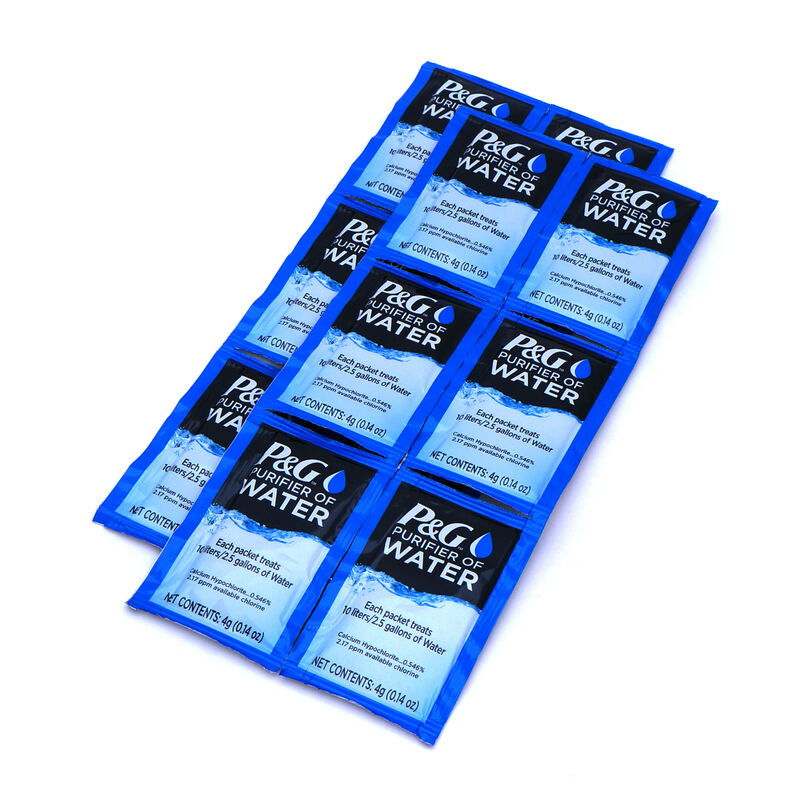 One pkg per bag of water. I need a gallon of clean water per day for drink and meals so this bag is large enough to meet my needs. I fill it as soon as I beach at my campsite and let it settle a bit as I set-up clam. Then I scoop or pour off the floaties and add one package of my Alum to a 1/2 liter Nalgene and shake. This 1/2-liter of Alum-water is added to the Platypus, stir and swirl clockwise for 30 seconds, then back-&-forth for a minute, then walk away. In 20 minutes or so, I have 4 liters of clear water on top of an inchor three of sediment. I set my intake hose of my Water filter into the platypus bag and filter the top clear water. If need be, I add a charcoal filter to the line. OK, now I want to convert everything to teaspoons per gallon. The highest dosis is 100x larger than the lowest. It must depend a lot on the river, what tributaries are running and other factors, but still, that's quite a range. Unless I made mistakes during the conversion.. I believe you. I can tell you the NPS is clueless. I have only had to use alum once so my approach was more like Riks but I didnt measure a darn thing. This link appears to still have the packets I used on the Yukon. Voyageur canoe with 7 paddlers, and we got all the drinking water we needed by treating 5 gallon buckets of highly silted Yukon River water. After pre-straining silty river water through a muslin filter, add two packets of the stuff per bucket. It not only settles the silt to the bottom of the bucket, but it also disinfects the water, making it safe to drink. Here is a formulation that worked for me on the Green River. Mix 2 teaspoon alum in a 1 Nalgene Liter bottle of water. Clearly mark this bottle as non-drinking, may not kill you but it's not water anymore. Add 2 or 3 capfuls to a 5-6 gallon bucket of silted water. Stir 1 minute clockwise, 1 minute counter. Wait 45-60 minutes and it should have settled out most of the silt. This worked consistently. Made two buckets each day which were usually used for cleaning things, Dipping out of them to preserve its possible used for filtering. Bring along the bottom of a plastic bottle with holes punched in its bottom, and you've got a tolerably good shower. Thanks Waterbearer. We'll be headed down to Moab in early May to do a Meander Canyon trip (Colorado River - Potash to Spanish Bottom). It will be a 5 day trip. I've done 4-5 day trips in Meander Canyon and Stillwater (Green River) several times in the last few years. We were always able to carry enough water & never filtered, but having the means to filter is always necessary. I carry a one gallon collapsible bucket, so I'd have to figure out the ratio of "alum blend" to water, but maybe one capful would work? Last year, just to experiment , we put about 1/8 tsp alum in a gallon of water, swirled, and let it sit. It appeared to work well.